For those interested in both art and commerce, an online degree in fashion merchandising is well worth considering. Fashion merchandising combines the business and aesthetic aspects of the fashion industry, offering the perfect field for those who want to blend their strategic and analytic side with their social and visual skills. 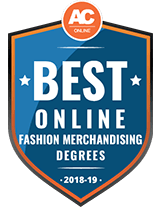 Read on to learn about online fashion merchandising degrees and how they can lead to various careers in the business side of fashion. 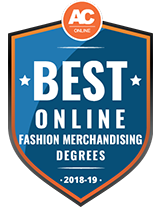 Fashion Merchandising is a perfect degree program for students interested in the business side of the fashion world, and students can now earn this degree in an entirely online format. Online learning will provide students with the knowledge necessary to successfully market fashion lines while allowing them to maintain their already busy schedules. By looking at specific data points—class sizes, graduation rates, and student-teacher ratio, for example—we’ve been able to narrow down the selection of schools throughout the country to the best programs available. Check out what we’ve found for the 2018 school year below, and find the fashion merchandising program for you. Through Hinds Community College's eLearning program, distance learners can earn an online Associate of Applied Science in Fashion Merchandising degree. In this program, degree seekers receive a foundational education that explores all major aspects of fashion marketing. The program prepares students for a multitude of careers in the fashion industry including sales, marketing and design positions. HCC ensures that, while working through the program, students develop a working portfolio that can assist them when entering the competitive fashion job market. Prospective students must submit their high school transcripts and ACT or ACCUPLACER scores to be considered for admission. The bureau of labor statistics provides the following data about job growth in the fashion industry. As well as the following national median salary data for several different careers in the field of Fashion. While some successful fashion merchandisers enter the field after trying different paths, others might notice signs pointing to a career in fashion merchandising early on, such as in the example milestone map below. Was offered a full-time position as boutique’s fashion merchandising manager. Fashion merchandising is a great potential field for many people, especially since the various degree options make fashion merchandising studies available to people of all education and professional backgrounds. However, fashion merchandising programs aren’t nearly as common as, say, liberal arts or accounting programs, leading many students to find alternative schools that offer the degree they seek. Online fashion merchandising programs provide an opportunity for students to pursue the major, regardless of their physical location. Through online study, students can earn fashion merchandising degrees on their own schedules from anywhere they’d like. Online education is increasingly popular, thanks to its convenience, flexibility and accessibility, and most online degree programs offer the same curricula as their brick-and-mortar counterparts. This means students can get quality educations in fashion merchandising without having to move or take time off work, which may be particularly important for prospective master’s students who already have steady jobs. Starting a fashion merchandising degree online may raise a few questions for students, especially when it comes to figuring out how to network with peers and professionals. Students need not worry, however, because online education lends itself well to communication and networking. Online students get to have engaging conversations through digital platforms, work with peers during field trips or group projects and connect with professionals during internships. Furthermore, fashion merchandising often involves internet marketing and communication with people worldwide, so earning a degree online can help students hone the digital communication skills needed to thrive in this increasingly global field. Online fashion merchandising courses may require students to log in at specific times to participate in live-streamed class discussions, but often students can log in at their convenience to view lectures, course materials and assignments. Online learning platforms allow students to have discussions with professors and peers at any time. Some programs may require in-person meetups for field trips to fashion shows, textile shops or markets, and students may have to complete an internship or capstone project, so remote students should check to make sure they are able meet all in-person program requirements before enrolling. Whether prospective fashion merchandising students are fresh from high school, have degrees or careers in other fields, can spend four years in school or only one, there is a suitable online degree program for them. Students should make sure that the degree type they choose meets their current needs and professional aspirations. An online associate degree in fashion merchandising will give students an overview of the business side of fashion. Associate degree programs may also give students a taste of the visual and development aspects of fashion through theoretical classes in textiles, color and fashion history. Online fashion merchandising associate degrees usually take around 60 credits to complete, so full-time students should be able to complete their degrees in about two years. Some programs may require an internship toward the end of the program, which is a good opportunity for students to network with professionals and gain real-world experience. Those who want a solid foundation in fashion merchandising that will prepare them for future studies or entry-level positions in the field are well-suited for an online associate degree. Along with coursework specific to the fashion industry, students pursuing an online bachelor’s degree in fashion merchandising will get a comprehensive education in business. Fashion merchandising bachelor’s degrees generally require students take a series of courses from the business and general education curricula, giving them a well-rounded education with a fashion merchandising focus. A bachelor’s degree in fashion merchandising requires an average of 120 credits, with around one-third of those credits earned through fashion-specific courses, such as fashion research or visual merchandising. Like associate degree programs, a bachelor’s in fashion merchandising may have an internship built into the curriculum. Full-time students can expect to earn their bachelor’s degree in fashion merchandising in about four years. A master’s degree in merchandising is a great option for those looking to further their fashion merchandising careers as well as those who have degrees in other areas but want to make a career change. There are two primary options for people seeking master’s degrees in merchandising: the Master of Science (M.S.) and the Master of Professional Studies (MPS). An M.S. in merchandising builds off prior retail education or experience to give students an advanced knowledge of merchandising practices. Since these programs are designed for students who work full time, they usually take around two years to complete. Students enrolled in an online merchandising M.S. program may learn about product development, research methods and national and international trade issues. An MPS, on the other hand, focuses more on practical, hands-on learning. MPS programs may be shorter than M.S. programs, and fashion merchandising students in professional programs often learn from industry professionals, giving them real-world advice and professional connections. Most MPS programs require an internship or capstone to demonstrate their skills in the field. Courses will vary by degree type and program, but certain classes are bound to show up in most online fashion merchandising programs. The following is a list of example fashion merchandising courses typically found in online programs. This class is less likely to show up in master’s degree programs, but associate and bachelor’s degree programs typically dedicate a class to the basic principles of fashion merchandising, like buying, selling, planning, evaluating design principles and advertising techniques. Students will learn marketing theory and practice as they relate to the field of fashion. Topics may include understanding consumer wants and conceiving of, producing, promoting, and moving new fashion goods and services to consumers. In consumer behavior courses, students will learn about the various psychological, sociological, cultural and other elements that influence consumers and drive them to buy certain products and follow certain trends. Retail management courses may teach students about adapting to trend changes, planning and pricing merchandise and other functions of running a successful retail business. Students may also learn about laws that affect retail operations. Many programs give students the opportunity to use their new knowledge and skills in a practical setting through fashion merchandising internships. Students may intern in career-relevant retail or marketing settings and can gain real-world experience, professional connections, employment opportunities and resume-enhancing skills. Determine whether you want an associate degree, bachelor’s degree, Master of Science or Master of Professional Studies and make sure the online school offers the specific program. Some schools are more design-focused while others provide a more business-focused education. Be sure to determine which type of program best fits your skills and career goals. Know whether or not you need to complete in-person components as part of the curriculum. Make sure that any in-person requirements fit your schedule and physical location. Understand and meet all GPA and other academic requirements the school may have. Make sure the institution and their online programs are accredited. Find out what types of support services—like career, technology or networking opportunities—online students can access. See what financial aid options the program or school offers and whether you qualify for it. Be sure that you can realistically afford the tuition. Not all online degree programs are equal, and it’s easy for students to unknowingly pay for an educational program that gets them a degree employers won’t recognize. One of the best ways to ensure they are getting a quality education is for students to find out whether their school is accredited, and by which accrediting bodies. Accreditation is an optional process that programs or institutions can undergo to prove that they maintain certain quality standards. Many employers are less likely to hire students who graduate from unaccredited institutions, and students will be unable to access federal financial aid unless they attend an accredited school. While there is no national accrediting body for art schools or fashion merchandising programs, students would be wise to see if their institution is accredited by regional or national bodies. Our comprehensive Accreditation Guide is a great source for those wanting to know more about the importance of accreditation and what to look out for. Prospective students can prepare for their online fashion merchandising degree program by knowing what steps they need to take beforehand and when to complete them. Making a timeline is a helpful way for students to keep on track and make sure they are prepared when it comes time for their program to begin. Below is an example of a schedule for a student looking to enroll in an online bachelor’s degree in fashion merchandising, although schedules may vary depending on the program and degree level sought. Prospective fashion merchandising students can begin preparing for their educations and careers as early as high school. Taking some preparatory steps and gaining skills and experience can help students be successful as they complete their online fashion merchandising degree programs. Work at your high school’s spirit store. Often, students get to choose apparel styles and create designs as well as managing sales and marketing strategies. Get a job in fashion or accessories retail. Even if it’s temporary or part time, the skills and experience will help prepare you for more advanced careers and studies. Start your own Etsy shop—or other online marketplace—or manage one for someone else. Stay up to date on trends. This could be by reading fashion blogs and periodicals or by attending events like fashion shows. Take a graphic design or sewing class. Fashion merchandising is more business-oriented, but knowing how the products you sell go from sketches to wearable items can be useful. Fashion merchandising is a broad field that can lead to a variety of careers that exist where business and fashion meet. Fashion merchandisers tend to buy, sell or market fashion products for a business or organization. They might analyze costs and benefits of products, negotiate with designers and manufacturers, manage retail employees, create marketing strategies and promotions and monitor inventory. It’s also important that fashion merchandisers are well-versed in current trends, as they often help shape and change them through the products and designers they choose to promote. Fashion merchandisers typically work in office environments, but it may be necessary for them to travel or attend industry events. Buyer and purchaser jobs are expected to increase by 2% between 2014 and 2024, which is slower than average for careers in the U.S. This means that, while many jobs in the fashion merchandising field only require related work experience, a degree in fashion merchandising can make job seekers more enticing to employers. People who hold fashion merchandising degrees, whether at the associate, bachelor or master level, can take on a variety of roles, from effectively running a retail business to analyzing data to maximize a fashion company’s profits. Below is a small handful of jobs available to graduates of online fashion merchandising programs. While there are no required certifications to become a fashion merchandiser, certain credentials can show employers and industry connections that graduates are qualified for various jobs in the fashion merchandising industry. Certifications in sales, retail and marketing can all help fashion merchandisers show that they adhere to high standards and are effective employees. The NRF is the largest retail trade association in the world. Retail management professionals who want to get certified by the NRF must take a test to prove that they are competent in five domains established by the association: administrative and financial accountability; operations; human resources; merchandising; and selling and services. Fashion merchandisers who work heavily in sales may want to become certified sales professionals. This certification is offered by the, Manufacturers’ Representatives Educational Research Foundation (MRERF) an organization that provides the training needed to successfully pass the certification exam. The American Marketing Association is a widely recognized professional organization that offers certification for marketers. In order to qualify for certification, applicants must have either a bachelor’s degree and four years of professional experience or a master’s degree and two years of professional experience, and the must pass the AMA’s certification exam. Prospective students who can see themselves working in art galleries and museums or researching the social, cultural and historical influences of art might find their calling in an online art history degree program. If designing, planning or figuring out the logistics of building structures and creating communities sounds interesting, then an online architecture degree is probably a better choice than one in fashion merchandising. Prospective students who are compelled by the design and structure of public parks, private yards or the principles behind rooftop gardens and the merging of natural and built environments should look into getting a degree in landscape architecture.